Michael McDowell picked up the 27th last-place finish of his NASCAR Sprint Cup Series career in Sunday’s Ford EcoBoost 400 at the Homestead-Miami Speedway when his unsponsored #98 Phil Parsons Racing Ford fell out with brake trouble after he completed 63 of the race’s 267 laps. The finish was McDowell’s eighth of 2013, equaling the all-time single-season last-place record set by his former PRISM Motorsports teammate Dave Blaney in 2009. It’s McDowell’s first last-place run since Texas, two races ago, and his fourth in the last ten races. It is also McDowell’s third last-place finish in the Cup finale at Homestead, joining his runs for Tommy Baldwin Racing in 2009 and for HP Racing LLC in 2011. McDowell came into Homestead having finished under power in three of his last four Cup Series starts, a clear sign of progress for a driver and team that have parked in nearly all of its Cup starts since 2009. Their best finish of the season remains a 9th in the season-opening Daytona 500, followed closely by their 15th-place run at Talladega last month. However, Homestead would also mark McDowell’s final start in the #98 as he prepares to drive the #95 Leavine Family Racing entry in 2014. 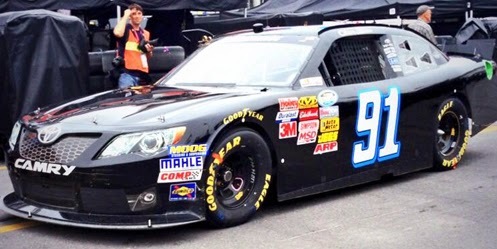 As of this writing, there is no word whether Phil Parsons Racing will field the #98 next year, nor who will drive. McDowell was 35th fastest in the opening practice, did not participate in the second, and ran 40th in Happy Hour. In between, he qualified 34th at an average speed of 172.260 mph. For the 22nd time in 36 points races in 2013, just 43 cars showed up to fill the 43-car field, so no one was sent home. At the start of the race, 43rd place was held by last week’s last-placer Tony Raines, back in Hillman Racing’s #40 Chevrolet. The spot then went to Travis Kvapil, who brought out the race’s first two cautions when he scraped the Turn 3 wall on Lap 12, then spun off Turn 4 on Lap 24. Kvapil fell off the lead lap, but was then passed by McDowell, who spent around twenty laps behind the wall. Joining him was A.J. Allmendinger, whose #47 Toyota broke a shock and spent at least ten laps in the garage for repairs. 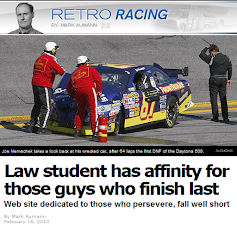 Although both returned to the track, McDowell remained in 43rd when he exited the race once more after 63 laps. Raines fell out before the halfway point to finish 42nd. Finishing 40th on Sunday was Josh Wise, who has finished no better than 30th since McDowell drove his #35 Ford at Watkins Glen. Trevor Bayne was diagnosed with multiple sclerosis last Tuesday, but proved he was more than ready to tackle the Homestead track. He ran as high as 11th near the halfway point, but lost the engine on his #21 Motorcraft / Quick Lane Tire & Auto Center Ford less than 50 laps from the finish. Rounding out the Bottom Five was July Daytona last-placer Paul Menard, who on Lap 232 endured the night’s most frightening moment when the right-rear hub on his #27 Chevrolet caught fire, causing the tire to explode on pit road. Menard and his crew were uninjured in the accident. *Ford had not finished last in a Cup Series race at Homestead since 2003, when Matt Kenseth, the year’s series champion, lost the engine on his #17 DeWalt Power Tools Ford after he completed 28 races of the Ford 400. This year, his first season since leaving the #17 Roush-Fenway team, Kenseth finished second in the race and in the points, 19 behind series champion Jimmie Johnson. *The #98 had never before finished last in a Cup Series race at Homestead. 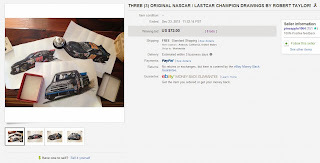 With the season over, I’d like to thank Robert Taylor for your support and incredible artwork, Rob Dostie for your on-track photography of the Bottom Five, the members of the Rubbin’s Racin’ Forums for helping me find other rare photos of last-place finishers, including sites like Motorsport.com, TheHotLap.com, Getty Images, and most of all, readers like you. 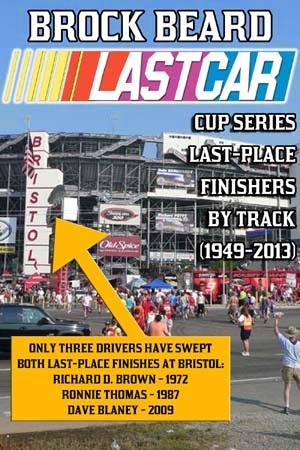 2013 LASTCAR eBOOK UPDATES COMING SOON! As I prepare for LASTCAR’s next season this coming February, I will be doing more work on my series of LASTCAR eBooks! 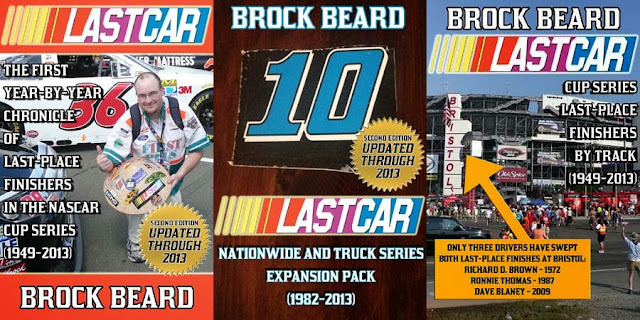 First of all, both my current publications - the LASTCAR Cup Series Chronicle and the Nationwide and Truck Series Expansion Pack, will be updated around the end of this month. If you have already purchased either eBook, you will be able to download the new version FOR FREE at the website where you purchased the 2012 edition. If you have not yet purchased either book, once you do, you will still have access to the updates, free of charge, when they are available. Stay tuned to this website for further details - I will post an announcement when the updates are available! 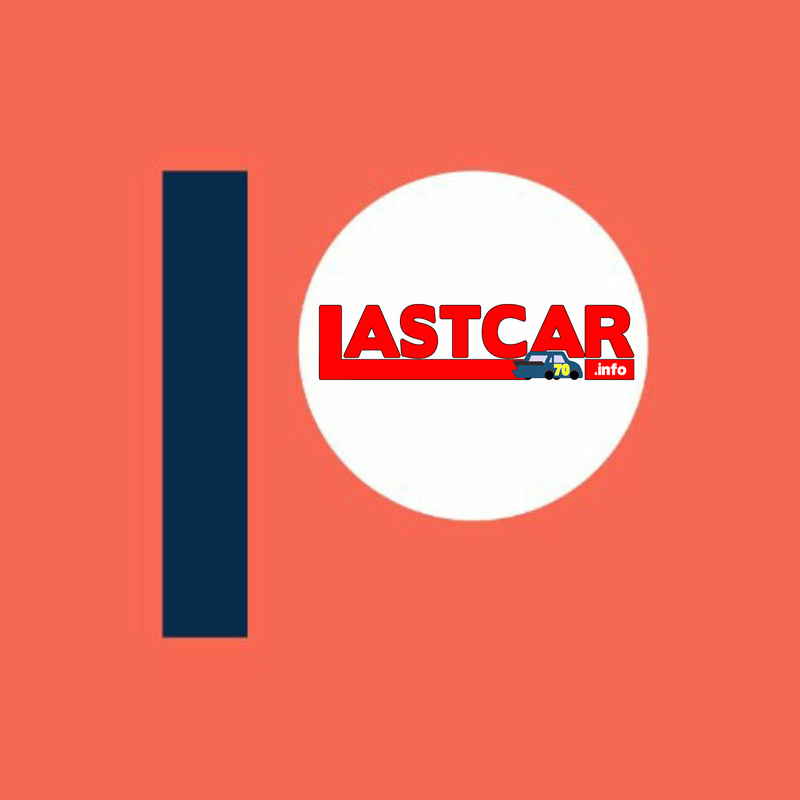 In addition, I am thrilled to announce that I have another LASTCAR eBook in the works. 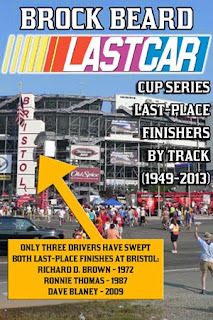 The working title is “LASTCAR: Cup Series Statistics By Track.” Ever wanted to know who has the most last-place finishes at Talladega? Or at the old Riverside International Raceway? This book will have the answers, and much more! It will go on sale when my current books are updated. 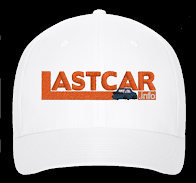 There are also two more LASTCAR eBooks in the works. Both are scheduled to be released sometime this winter. Stay tuned to this website for more details! I will post a message here and on my Twitter @LASTCARonBROCK when the updates and the new books are available! Happy Thanksgiving, Merry Christmas, and Happy Holidays to you all! J.J. Yeley picked up the 2nd last-place finish of his NASCAR Camping World Truck Series career in Friday’s Ford EcoBoost 200 at the Homestead-Miami Speedway when his #07 BYF.org / nccer.org Toyota fell out with a fuel pump issue after he completed 2 of the race’s 148 laps. The finish was Yeley’s first of the 2013 season and his first in a Truck Series race since the fall of 2011, when he fell out with transmission failure after the opening lap at Talladega. It is also the second last-place run for the #07 Ken Smith team, which most recently trailed the field with Jimmy Weller at Martinsville, three races ago. The original 36-truck entry list increased to 40 before practice, including the late entries of Mike Harmon in the #84 and Brad Riethmeyer in the #50. However, two teams withdrew before practice. The #1 Rick Ware entry of last week’s last-placer D.J. Kennington started by putting Carl Long in the truck, then withdrew along with the #0 of 2013 LASTCAR Truck Series champion Chris Lafferty. 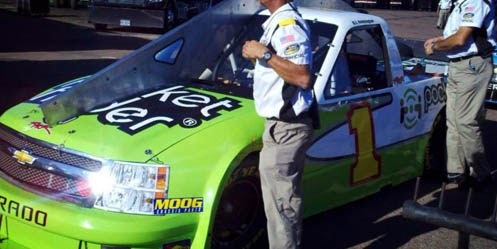 Lafferty’s withdrawal prevented him from having a chance at breaking the single-season Truck Series record of seven last-place finishes, leaving him tied with Phil Bonifield (1999) and Mike Garvey (2011). The 38 remaining trucks practiced and qualified at Homestead. Yeley timed in 32nd in practice, then improved to 31st in qualifying at an average speed of 161.929 mph. Missing the race were Jennifer Jo Cobb, Lafferty’s team owner and teammate, and Brad Riethmeyer. Yeley pulled behind the wall after two laps, followed by RSS Racing teammates Chris Jones (#38) and Travis Kvapil (#93), who exited just before the first debris caution on Lap 6. Finishing 33rd was Chad McCumbee, making his first Truck Series start of the season in his first start behind the wheel of the #99 Bell Trucks America Ford previously driven by Bryan Silas. 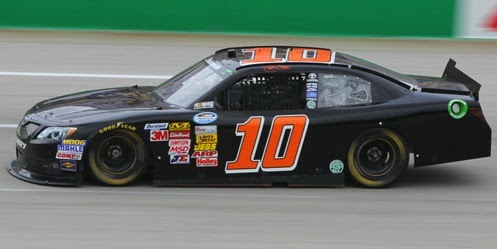 Rounding out the Bottom Five was Spencer Gallagher, 10th in the 2013 ARCA standings, who was involved in a grinding two-truck crash exiting Turn Four on Lap 103. Gallagher, competing in his first partial Truck Series season for his family’s team, was uninjured in the crash. *This was the first time a Truck Series last-placer fell out of a race due to a fuel pump issue since June 23, 2001, when Bobby Coffey’s #74 Bo-Co Performance Chevrolet exited the Memphis 200 at the Memphis Motorsports Park on the opening lap. It was one of just two career starts for Coffey. Tony Raines picked up the 10th last-place finish of his NASCAR Sprint Cup Series career in Sunday’s AdvoCare 500 at the Phoenix International Raceway when his #33 Little Joe’s Autos Chevrolet fell out with brake problems after he completed 29 of the race’s 312 laps. The finish was Raines’ second of 2013 and his first since Talladega, three races ago, when he was driving the #40, the Hillman Racing team’s second car. For Phoenix, Raines moved to the #33 Chevrolet while part-time teammate Landon Cassill drove the #40. Both Chevrolets were virtually identical - dark blue cars with blank white hoods, though Cassill’s roof numbers were a dark orange. Raines timed in 42nd in the first two practice sessions and 43rd in Happy Hour. He improved to 41st in qualifying with a speed of 132.057 mph, just ahead of Dave Blaney and Joe Nemechek. Cassill qualified just in front of Raines in 40th. At the start of Sunday’s race, Raines slipped behind Blaney, then Nemechek and held the 43rd spot. 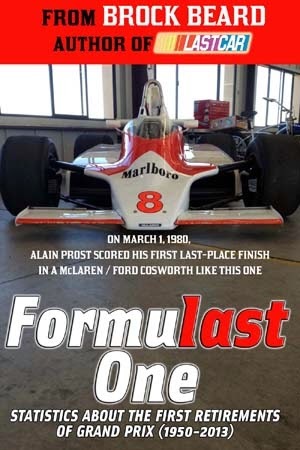 He was still running there in the early laps when he became the first car to lose a lap. Just past the halfway point of the opening 50-lap green-flag run, Raines pulled behind the wall. Several other drivers battled for 42nd through the first 100 laps, including Timmy Hill in the #32 U.S. Chrome Ford. However, once Cassill pulled behind the wall after 63 laps, he eventually slid down to 42nd. The remaining occupants of the Bottom Five exited the race in spectacular fashion. 41st-place Travis Kvapil lost an engine entering Turn 1 on Lap 132, dropping oil and sending up a huge plume of smoke that caused Dave Blaney to spin. 40th-place Cole Whitt ended up with a destroyed #30 Lean 1 Toyota when he piled into a three-car wreck between David Reutimann, Jeff Burton, and Danica Patrick. Reutimann continued with right-front damage, then suddenly lost his brakes on Lap 192, sending him rear-first into the Turn 1 wall so hard that it folded his rear windshield in half, leaving him 39th. No drivers were injured in these incidents. 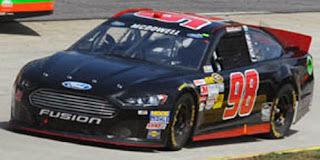 For the third time in the last four races, 2013 LASTCAR Cup Series Champion Michael McDowell finished a race under power with full sponsorship on his #98 Phil Parsons Racing Ford. This time, he ran his GunBroker.com Ford to a 32nd-place finish, four laps down to race winner Kevin Harvick. However, by not finishing last, McDowell will not be able to break the Cup Series single-season last-place record in 2013. The record is eight last-place finishes, held by Dave Blaney in 2009. McDowell can still tie Blaney with a last-place run at Homestead next week, where he has finished last in two of the last four runnings. *This was Raines’ first last-place finish in a Cup race at Phoenix since 2009, the year he swept both last-place finishes at the track for two different teams: in the spring for the #73 team owned by Barry Haefele and in the fall driving the #37 owned by Front Row Motorsports. *Chevrolet had not finished last in a Cup race at Phoenix since the fall race in 2010, when Brendan Gaughan’s #71 South Point Hotel and Casino Chevrolet was involved in a single-car accident on Lap 2 of the Kobalt Tools 500. *The #33 had never before finished last in a Cup race at Phoenix. Michael McDowell picked up the 26th last-place finish of his NASCAR Sprint Cup Series career in Sunday’s AAA Texas 500 at the Texas Motor Speedway when his unsponsored #98 Phil Parsons Racing Ford fell out with a vibration after he completed 27 of the race’s 334 laps. The finish was McDowell’s seventh of 2013 and his first since Dover, five races ago. Now two finishes ahead of second-place Mike Bliss in this year’s last-place standings with just two races to go, McDowell has secured the 2013 LASTCAR Cup Series Championship. Bliss, who has not started a Cup race since Atlanta in September, would lose the championship even if he finished last at both Phoenix and Homestead. McDowell already leads the bottom-five tiebreaker 23-11. McDowell is the first Cup driver ever to score three consecutive LASTCAR Cup Series championships. 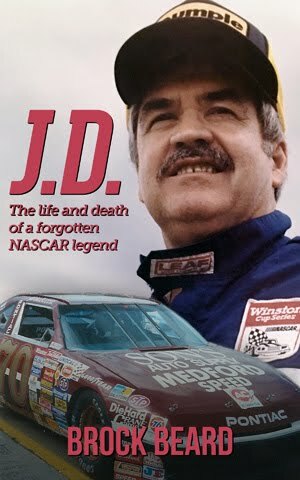 The late J.D. McDuffie scored three out of four from 1984 through 1987. McDowell’s three titles have all come driving for Phil Parsons, who in 2010 signed the former Michael Waltrip Racing rookie to join Dave Blaney at PRISM Motorsports. When Blaney eventually left to join Tommy Baldwin Racing, McDowell became the team’s only driver for HP Racing LLC, the Parsons team’s new name in 2011. McDowell claimed the 2011 LASTCAR title in a close contest with Travis Kvapil, then driving a “start-and-park” entry, #55, for Front Row Motorsports. The next two titles came after the Parsons team merged with Whitney Motorsports who, with the help of longtime Cup owner Mike Curb, formed Phil Parsons Racing. Last year’s title chase was again a close one as McDowell claimed the title in a bottom-ten tiebreaker over Reed Sorenson, driving for former PRISM partner Randy Humphrey. This week, it was announced that McDowell would be leaving the Parsons team in 2014 to replace Sorenson as driver of the #95 Leavine Family Racing team. 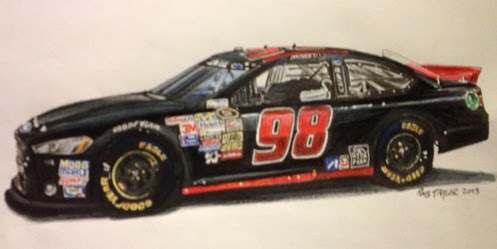 McDowell drove the #95 in his first-ever start in the Sprint Showdown at Charlotte this past May. McDowell finished 14th in the 23-car field. Like the Parsons team, which turned in an impressive 9th in the Daytona 500 and a 15th last month at Talladega, the Leavine team has also turned heads in 2013, finishing 9th with driver Scott Speed in the spring Talladega race. At Texas, McDowell began the weekend filling in for 2013 LASTCAR Nationwide Series Champion Jeff Green as driver of the #10 TriStar Motorsports Toyota while Green relieved TriStar teammate Eric McClure in the #14. McDowell finished last that day and was set to start 35th for Sunday’s Cup race. McDowell secured the spot with a lap of 189.321 mph, having turned in the 40th fastest time in the opening practice, then improved to 37th in Happy Hour. At the start of Sunday’s race, last-place was juggled between 43rd-place starter J.J. Yeley, who spun out in his qualifying attempt, and the #87 of Joe Nemechek. Nemechek was still running near the back when the first caution came out for debris on Lap 16. Under the yellow, McDowell decided not to pit in order to lead a lap. He ran on the outside of Carl Edwards before surrendering the lead on the backstretch just before the green flag. McDowell pulled out of the race soon after the restart, securing him the 43rd spot. It was the first time a driver finished last in the Cup and Nationwide races at the same track and on the same weekend since Josh Wise at Bristol in the spring of 2012. Finishing 42nd was David Ragan, last week’s last-placer at Martinsville, who suffered another engine failure after 81 laps. Jeff Gordon, who wrecked in Turn 1 on Lap 75, had fallen as far back as 42nd, but returned to the track in the final sixty laps to climb up to 38th. The rest of the Bottom Five included 41st-place Timmy Hill, whose engine let go after 125 laps, Bobby Labonte, who also lost an engine after 144, and Josh Wise in Front Row’s #35. *McDowell is the first Cup Series last-place finisher this season to have led a single lap in the same race. *McDowell has swept both Cup Series last-place finishes at Texas in 2013. In the spring, his car overheated after 44 laps, and he relieved an ailing Bobby Labonte for a few additional laps. Michael McDowell picked up the 2nd last-place finish of his NASCAR Nationwide Series career in Saturday’s O’Reilly Auto Parts Challenge at the Texas Motor Speedway when his unsponsored #10 TriStar Motorsports Toyota fell out with a vibration after he completed 4 of the race’s 200 laps. The finish was McDowell’s second of 2013 and his first since Bristol last spring, twenty-seven races ago. McDowell was making his first Nationwide Series start since his runner-up performance at Mid-Ohio in August and his first-ever for TriStar Motorsports. Jeff Green, who had already secured the 2013 LASTCAR Nationwide Series title in the #10 five races ago, was set to drive the car at Texas. However, when Green’s teammate Eric McClure was again sidelined by illness, Green took over the fully-funded #14. McDowell, tabbed as Green’s replacement, ran 28th-fastest in the first practice, 27th in Happy Hour, then timed in 24th in qualifying at an average speed of 180.192 mph. The only the driver to miss the field was July Daytona last-placer Morgan Shepherd in his #89 Chevrolet. At the start of Saturday’s race, McDowell pulled the #10 behind the wall just one lap before Michigan last-placer Dexter Stacey in the #92 Maddie’s Place Rocks Ford. Finishing 38th was Josh Wise, securing yet another bottom-five finish for The Motorsports Group in his #42, followed by Johanna Long in the #70 ForeTravel Motorcoach Chevrolet and the #00 FrontlineWraps.com Toyota of Blake Koch. Jeff Green finished 27th, four laps down, in McClure’s #14 Hefty Ultimate / Reynolds Toyota. *Despite the driver change, the #10 TriStar Motorsports team successfully swept both last-place finishes at Texas in 2013. Four of the last six Nationwide races at this track have had a TriStar car finish last with three of those coming with Jeff Green. Chris Lafferty picked up the 9th last-place finish of his NASCAR Camping Word Truck Series career in Friday’s WinStar World Casino 350 at the Texas Motor Speedway when his #0 OEM Auto Parts Plus / Koma Unwind Chevrolet fell out with transmission troubles after he completed 4 of the race’s 147 laps. The finish was Lafferty’s sixth of 2013 and his first since his most recent start at Las Vegas, three races ago. With two races to go and a three-finish lead over second-place Chris Jones in the 2013 last-place standings, Lafferty has officially clinched this year’s LASTCAR Truck Series Championship, his first in any of NASCAR’s top divisions. It is a successful comeback for the #0 Jennifer Jo Cobb-owned team, which last year lost the title in a bottom-five tiebreaker with RSS Racing’s #38 driven by Dennis Setzer. Lafferty’s title also ends RSS Racing’s streak of three consecutive LASTCAR Truck Series titles. Lafferty did not practice in the opening session, but timed in 34th in Happy Hour, then secured the 35th and final starting spot for the race with an average speed of 154.985 mph. With just thirty-five trucks for as many spots, no one was sent home. Lafferty and three others in the Bottom Five fell out during the opening green-flag run. By a single lap, he edged Morgan Shepherd for the spot. 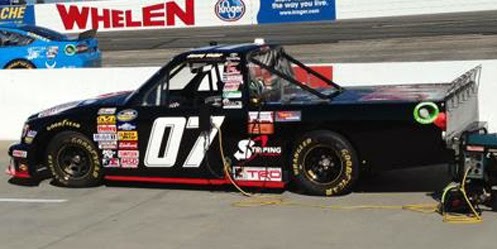 The 71-year-old Shepherd, making his first Truck Series start since 2008, fell out with transmission trouble in Norm Benning’s second truck, #75. J.J. Yeley, driving the #07 that finished last the previous week in Martinsville with newcomer Jimmy Weller, finished 33rd, followed by the RSS Racing #38 of LASTCAR title runner-up Chris Jones. Rounding out the Bottom Five was Mike Harmon, whose #84 WCIParts.com Chevrolet lost the transmission after 31 laps. *This was the first last-place finish for the #0 in a Truck Series race at Texas since June 11, 2004, when Loni Richardson’s Value Tool & Engineering Chevrolet lost the rear end after 2 laps of the O’Reilly 400K. *This was Lafferty’s first last-place finish in a NASCAR race at Texas. 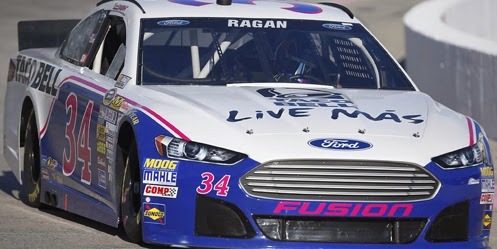 David Ragan picked up the 2nd last-place finish of his NASCAR Sprint Cup Series career in Sunday’s Goody’s Headache Relief Shot 500 at the Martinsville Speedway when his #34 Taco Bell Ford fell out with an engine failure after he completed 109 of the race’s 500 laps. The finish was Ragan’s first of 2013 and his first in a Cup race since the 2012 Daytona 500, when he was involved in a multi-car crash on the second lap of the race. Competing in his second season for Front Row Motorsports, Ragan authored one of the most incredible upsets in NASCAR Cup Series history. With darkness approaching in the rain-delayed Aaron’s 499 at Talladega, Ragan pulled off a last-lap pass on Carl Edwards to claim his second series victory. Teammate David Gilliland pushed Ragan to the victory, and in the process matched his own career-best finish of 2nd at Sonoma in 2008. In last week’s return to Talladega, Ragan and Gilliland finished nose-to-tail in 6th and 7th. Unfortunately, much of 2013 has still been a struggle for Ragan, Gilliland, and their teammate Josh Wise. In the thirty-two races before Martinsville, Ragan had finished 21st or worse in twenty-eight of them, including Bottom Fives at Phoenix (38th) and Darlington (39th). He finished 30th at Martinsville in the spring. After running 34th in the opening practice, Ragan stunned the field by qualifying 8th at an average speed of 98.815 mph, making him one of eighteen drivers to break Jimmie Johnson’s track record set in the spring. It was Ragan’s best start at Martinsville since the spring of 2008, when he qualified 4th, and followed-up an equally-strong 7th starting spot last week at Talladega. Despite this, Ragan timed in only 27th and 31st in Saturday’s final two practices. At the start of Sunday’s race, Ragan slipped back to the 11th spot when the first caution fell on Lap 8. The yellow flew when Jeff Burton spun in the fourth corner, causing the flat black #7 Chevrolet of Dave Blaney to rear-end the #93 Dr. Pepper Toyota of Travis Kvapil. Blaney broke an oil cooler in the incident, and the fluid he leaked around the track forced twelve laps of caution. Blaney remained in 43rd for much of the race as the crew effected repairs. Ragan was running around mid-pack when he suddenly slowed on Lap 110 and pulled behind the wall with engine trouble. At almost the exact same time, Blaney returned to the track. While Ragan’s incident did not bring out the caution flag, another engine failure by upstart Kyle Larson in the #51 Target Chevrolet did, by which point Blaney was closing on Ragan for 42nd. Near the halfway point, Blaney passed Ragan, dropping the #34 to the 43rd spot. Behind Ragan and Larson in the Bottom Five was Tony Raines, last week’s Talladega last-placer, who lost the brakes on his unsponsored #33 Chevrolet. Reed Sorenson returned to the track in the #95 Leavine Family Racing Ford, and though he lost several laps early, he continued past the halfway point before the rear gear locked-up in Turn 4 on Lap 285. Blaney rounded out the Bottom Five. For the second-straight race, Michael McDowell, still the leader in the 2013 LASTCAR Cup Series Championship, had sufficient funding to run the entire race. Driving the #98 Pray For Your Pastor Ford, McDowell was plagued by persistent brake problems that left him laps down for much of the event. But past the halfway point, he found himself as the first car off the lead lap. With no one just one lap down, McDowell received the Lucky Dog in four of the race’s last six cautions, ultimately putting him back on the lead lap. The brake problems worsened, however, causing his right-rear hub to ignite late in the race, and he finished two laps down - but still under power - in the 26th spot. It’s McDowell’s best-career finish at Martinsville, matching the 26th-place finish in his Cup debut here in the spring of 2008. *This was the first last-place finish for the #34 in a Cup Series race at Martinsville since October 22, 2006, when Kevin Lepage’s Oak Glove Co. Chevrolet broke a rear gear after 209 laps. Lepage’s car was also owned by Front Row Motorsports, which at the time was competing in just its second season on the tour. *This was the best starting spot by a last-place finisher of a Cup Series race at Martinsville since October 1, 2000, when Ward Burton’s #22 Caterpillar Pontiac started 4th, then lost the engine after 61 laps of the NAPA AutoCare 500. Jimmy Weller picked up the 1st last-place finish of his NASCAR Camping World Truck Series career in Saturday’s Kroger 200 at the Martinsville Speedway when his #07 BYF.org Toyota fell out with a busted rear gear after he completed 6 of the race’s 200 laps. The finish came in Weller’s fourth series start. Looking to build on his twenty starts in the NASCAR K&N Pro Series East, Weller, a 27-year-old driver from Ohio, has made the move to the Truck Series in 2013 on a part-time schedule. His series debut came with Bobby Dotter’s team at Iowa, where he finished a season-best 24th in the #81 GrimeBoss / GunBroker Toyota. Since then, Weller has made another four attempts behind the wheel of Ken Smith’s #07. After missing the field at Eldora, he made his next two starts in the summer Iowa race and at Chicago, but failed to finish both races. At Martinsville, Weller didn’t participate in the first practice session and was just 37th of the 38 entered trucks in final practice. He qualified 34th at an average speed of 89.044 mph. Weller was actually 36th-fastest of the 38 entrants, but was locked-in on Owner Points, bumping out 34th-fastest Spencer Gallagher in his family-prepared #21 Allegiant Air Chevrolet. Joining Gallagher on the DNQ list was Jennifer Jo Cobb, slowest among the qualifiers. It was her fourth DNQ of 2013 and her second in a row. The first caution of the day came three laps into the race, when the #39 RSS Racing Chevrolet of Ryan Sieg spun on the entrance of Turn 1. Clay Greenfield was also off the pace in his #68 ClutchDefense.com Dodge. When the race restart on Lap 7, Weller pulled behind the wall, followed immediately by the #6 Jack Link’s Beef Jerky / Express Oil Change Chevrolet of Daniel Hemric. Hemric, making his series debut, spent several laps behind the wall to replace a transmission, but returned to the race to finish 32nd. Weller did not return to the race and held onto the last-place finish. Finishing next-to-last on Saturday was Chris Jones in the RSS #93, five laps ahead of Weller. With now three races to go, Jones remains two finishes behind Chris Lafferty for the 2013 LASTCAR Truck Series Championship. Lafferty and the #0 Jennifer Jo Cobb-owned entry did not start Saturday’s race, and have not started a Truck Series race since Las Vegas. However, Lafferty can still clinch the title without another start if Jones fails to finish last in two of these final three races. In the event of a tiebreaker, Jones already has an insurmountable lead over Lafferty in Bottom Fives, 13-9. 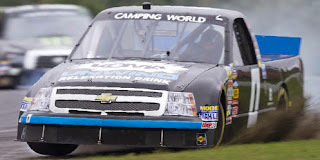 The rest of the Bottom Five included 34th-place Bradley Riethmeyer, making his first Truck Series start since Gateway in 2008, and Bryan Silas, who was involved in a multi-truck accident in the closing stages. *This was the first last-place finish for Toyota in a Truck Series race at Martinsville since 2008, when Sean Caisse and his #9 Germain.com / Lumber Liquidators Toyota crashed after 44 laps of the Kroger 200. *This was the first last-place finish for the #07 in a Truck Series race since last year at Chicagoland, when Johnny Chapman’s Wear Your Gear / bobber.info Toyota fell out with a vibration after two laps of the American Ethanol 225. 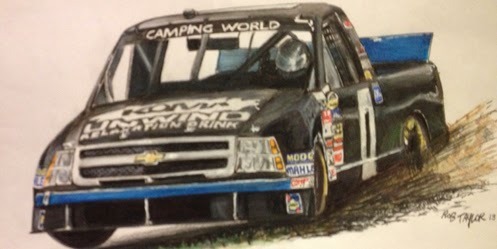 The number had never before finished last in a Truck Series race at Martinsville. Tony Raines picked up the 9th last-place finish of his NASCAR Sprint Cup Series career in Sunday’s Camping World RV Sales 500 at the Talladega Superspeedway when his unsponsored #40 Hillman Racing Chevrolet fell out with an engine failure after he completed 2 of the race’s 188 laps. The finish was Raines’ first of 2013 and his first in a Cup race since November 15, 2009, when his #37 Long John Silver’s / A&W Chevrolet fell out with electrical problems after six laps of the Checker O’Reilly Auto Parts 500 at Phoenix. Raines, a Cup Series veteran with 177 series starts, was making his eighth start of 2013. All eight have come while driving cars owned by Joe Falk. Falk returned to the Cup Series as a part-time owner in 2011 following an eleven year absence. Last year, Falk acquired the #33 team from Richard Childress Racing in the aftermath of Clint Bowyer’s offseason move to Michael Waltrip Racing. Raines made two of his seven starts that season driving Falk’s #33 Chevrolets, finishing 34th at Texas and 38th at Talladega. Raines shared his ride with Stephen Leicht, who was declared last year’s Rookie of the Year despite making just fifteen starts. This year, Falk’s team has coordinated its efforts with RCR in order to get Childress’ grandson Austin Dillon a chance at the Cup Series before his first full season in 2014. The result has been a continuous game of musical chairs between Dillon, Raines, Landon Cassill, Ron Fellows, and Brian Scott. Much like Danica Patrick’s arrangement with Tommy Baldwin Racing last year, this has resulted in two different teams running the same car number with different crews, both sharing the same owner points. Dillon has made four starts in the #33 this season, having qualified 8th for the Daytona 500 and finished 11th at Michigan in June. Cassill, who’s run the #33 in twenty of his twenty-nine starts this year, scored a season-best 22nd at Talladega in the spring. 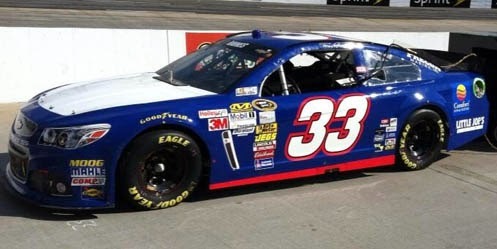 Ron Fellows ran the #33 at both road courses, finishing 22nd at Sonoma and 35th at Watkins Glen. At Indianapolis, Falk debuted a second team, #40, and had Cassill drive that car to a 33rd-place finish while Dillon finished 26th in the #33. The next week at Pocono, Tony Raines made his first start of the year in the #33 while Cassill ran the #40. Raines moved over to the #40 at Dover and finished 40th, then came home a season-best 29th the next week at Kansas. Last week at Charlotte, Cassill drove the #40 while Brian Scott made his Cup debut in the Childress-prepared #33. Talladega would see Raines return to the track in the #40 with Cassill in the #33. Dillon would be in the field as well, making his second start in the #14 in relief of the injured Tony Stewart. Forty-four cars showed up to qualify for Sunday’s race. Time trials were washed out by rain, so the field was set by practice speeds, and Sam Hornish, Jr.’s #12 SKF Ford was sent home based on attempts and owner points. Raines secured the 41st starting spot while Cassill trailed the field in 43rd. Raines was 42nd in the opening practice and 28th out of 29 cars in Happy Hour. At the start of Sunday’s race, Raines remained near the rear of the field with Cassill and Joe Nemechek. Just two laps into the race, Raines’ car trailed smoke off of Turn Two, bringing out the first caution of the day. He pulled behind the wall, done for the afternoon. Nemechek pulled out fifty-eight laps later with engine trouble. Finishing 41st was Juan Pablo Montoya, taken out in a two-car crash in the tri-oval after Marcos Ambrose lost control to his outside. Ambrose finished under power in 39th, passing David Reutimann, who came home 40th after a late engine failure. Dillon ended the race prematurely with a rookie mistake when he lost control on the final lap while racing for 2nd, then slid into traffic. He collided with Casey Mears, sending Dillon’s Chevrolet into the air. Dillon and Mears were uninjured in the crash. Barely avoiding involvement in Dillon’s wreck was Michael McDowell, still the leader in the 2013 LASTCAR Cup Series standings. McDowell finished an impressive 15th on Sunday, but ran as high as 8th with fifty laps to go. His #98 Ford carried last-minute sponsorship that afforded him the opportunity for the team to run its first full race since Indianapolis in July. It’s McDowell’s best Cup finish since he came home 9th in the season-opening Daytona 500. *This was the first last-place finish in Cup for the #40 since 2008, when Dario Franchitti’s Juicy Fruit Slim Pack Dodge lost the engine after 30 laps of the Lifelock 400 at Michigan. It was the only last-place finish of Franchitti’s abbreviated rookie season in Cup. The team folded less than a month later, ultimately leading to his return to the IndyCar Series the following season. Franchitti is currently recuperating from injuries suffered in a violent IndyCar accident at Houston two weeks ago. 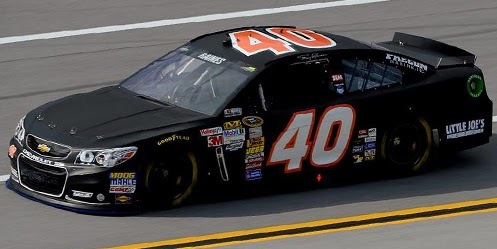 *Neither Raines nor the #40 had ever before finished last in a Cup race at Talladega. 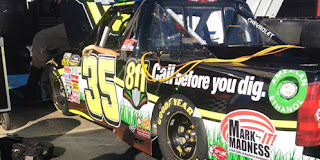 Mason Mingus picked up the 1st last-place finish of his NASCAR Camping World Truck Series career in Saturday’s Fred’s 250 at the Talladega Superspeedway when his #35 811 Call Before You Dig Chevrolet fell out with an oil leak after he completed 5 of the race’s 94 laps. The finish came in Mingus’ first series start, and his first in NASCAR. Mingus becomes the fourth Truck Series driver to finish last in his series debut in 2013, joining Scott Saunders, Jeff Babcock, and Ricky Ehrgott. Mingus, just eighteen years old, has made thirty-four starts in the ARCA Racing Series. Though winless in that division, he was this year’s runner-up in points behind Frank Kimmel with an average finish of 7.5. With the ARCA season wrapped up two weeks ago in Kansas, Mingus and owner Kevin Cywinski turned their attention to the Truck Series. Cywinski himself made forty-six starts in the series from 1997 through 1999. In his final season, he scored a pair of top-five finishes at Martinsville and Bristol while driving the #31 Auto Trim Design Ford for another part-time racer, Bob Brevak. Mingus would make his Truck Series debut at Talladega, bringing with him ARCA sponsorship from the 811 safe digging campaign. Mingus qualified an impressive 12th for the race at an average speed of 174.541 mph, making him the fastest of the thirteen “go-or-go-homers” who attempted to qualify. It was a huge improvement from his 31st-fastest time in the final practice session. 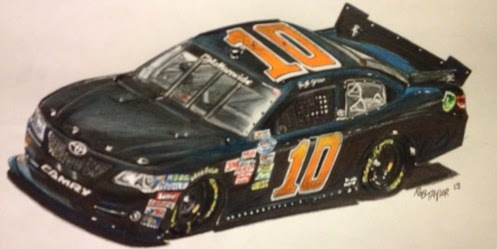 Missing the race were Danny Efland, who finished last in the Nationwide Series at Dover, and Jennifer Jo Cobb in her #10 Dodge RAM. At the start of the race, Mingus was still running with the leaders when he started leaking oil after only two laps. The leak grew worse, bad enough for him to pull onto pit road during the opening green-flag run. He pulled behind the wall after only five laps, done for the day. His oil brought out the first yellow on Lap 9. Twenty-two laps behind Mingus in 35th was Chris Jones, who stayed out to lead Lap 21 during a round of caution-flag pit stops, then parked his #93 RSS Racing Chevrolet. Rounding out the Bottom Five were three trucks involved in a pileup on Lap 67: the Ken Smith-owned #07 Advanced Communications Group Toyota of Chris Cockrum, the #82 Empire Racing Ford of fellow ARCA driver Sean Corr, and Brennan Newberry in the #24 Qore-24 Chevrolet. *This is the first last-place finish for the #35 in a Truck Series race at Talladega. It’s also the first time the number finished last in this series since February 18, 2000 - the day of the inaugural Daytona 250 at Daytona. Finishing last that day was David Starr, whose #35 Unified Office Network Chevrolet lost the engine after ten laps. 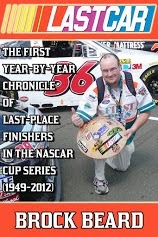 This race is much better known for the violent multi-truck accident that severely injured Geoffrey Bodine.